You know how simple humans wanting to become vampires is so popular in the paranormal literature? Well Maizel did just the opposite! Infinite Days is about a Vampire Queen named Lenah, who’s tired of her vampire life and wants to become human again. And she’s ready for anything. Her Soul mate offers her to hibernate for 100 years, while he researches the ritual, and he will then wake her and transform her on the Nuit Rouge, aka Halloween. What she doesn’t know though, is that he tricked her, and sacrificed his own life to offer her a human life. She must now live the life of a 16 years old girl, in a century she knows nothing of, while grieving her soul mate and her coven, because surely, they wouldn’t be happy to know she’s now a weak human. Can she blend in? Can she survive the hunt? 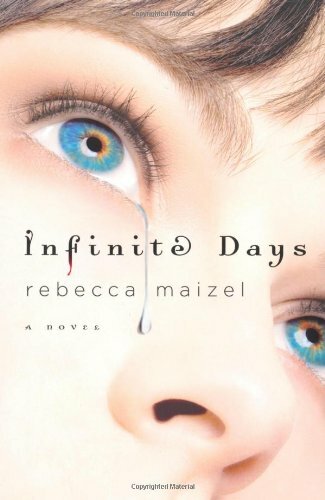 Let me start by saying that I LOVED Infinite Days! I really like its original plot line and its unique Lore. The Vampires in this book have the regular weaknesses: staking, beheading, sunlight, yet they are very different because Rebecca offers a reason why they are cruel. Why they act like they do, not that it’s an excuse, but it gives those evil creatures a more layered personality. I truly enjoyed the numerous flashback to different periods in Lenah’s life – or afterlife – because it provided a better sense of who she really is, her relationship with Rhodes, her soul mate, and Vicken, her lover. How she came to loathe her vampire life. Characters from both present and past were quite interesting and Rhodes, even though he is actually dead (as in really dead, not undead) 95% of the book, was my favorite character. I know it’s kinda odd to say, but through Lenah’s memories, I truly fell in love with him. I also really liked Tony, a human boy with artistic talent and funny retorts. I think the main reason I loved this book so much is its richness. I left like every details of every scene, every emotions, every memories were believable, tangible, real. Rebecca Maizel brings the story to life amazingly well and I can only bow down to her. The beginning of the book got me shedding a few tears, and so did the end. It’s a real torture to end a story that way, leaving us hanging at every single word Rebecca lays on the page, and leave us to wait until summer 2012 for a sequel. I strongly recommend getting your hands on Infinite Days because it’s a stand-out among YA paranormal literature, but you might wanna wait until you also get hold of Stolen Nights before you read it, because it’s gonna drive you mad. I finished reading it 2 weeks ago, and I still think about it! Do not be surprised by your greatness, Lenah Beaudonte. Be surprised that no one expected it. It's been a while since I read this book but you hit on all the reasons why I loved it too ^-^ Really great review! Excellent book. Looking forward to the sequel. Yet another book that I have had on my shelf for a while but haven't read yet. I'm glad that you loved it, hopefully you won't have to wait too long for book two but they keep changing the release date! ouuuu I have been looking at this for a little while! Thank you for sharing your thoughts!! I remember reading this book and absolutely loving it. Such a unique story! Hopefully we'll read the sequel soon. @Alexa Will you wait for second book before you read it?